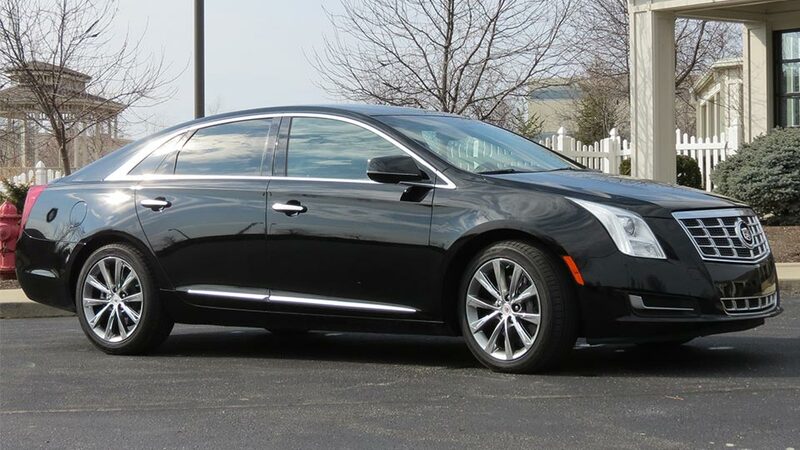 Our 2016 Cadillac XTS can accommodate 3 passengers. 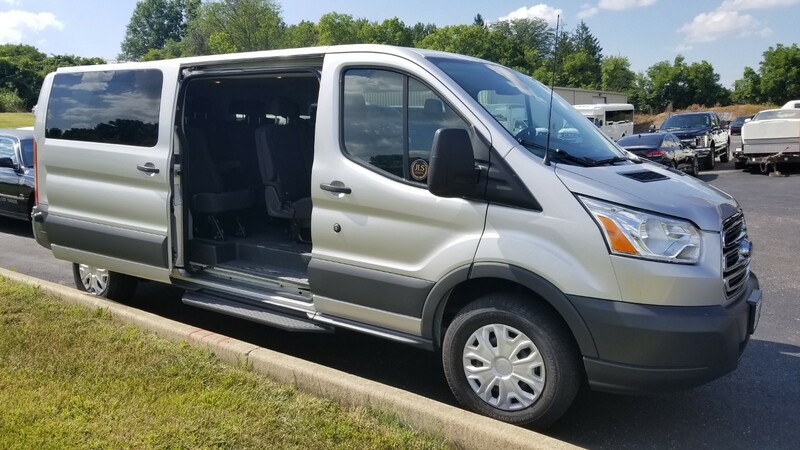 This vehicle is ideal for arrivals and departures to the Greater Cincinnati airport, concert transportation, and as directed car service throughout Cincinnati, Dayton and Northern Kentucky. Our Lincoln MKT is a stylish and versatile vehicle which perfectly combines power with efficiency. 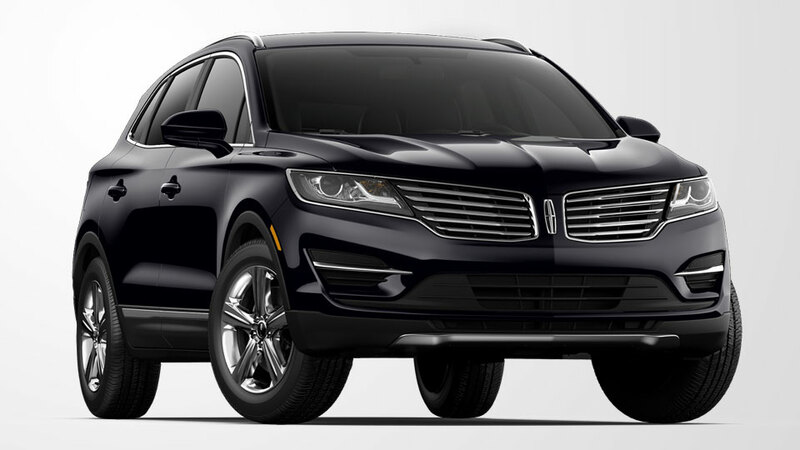 Perfect for both corporate and personal trips, the black Lincoln MKT is spacious and can accommodate up to 3 passengers in comfort and style. It comes with a lot of upscale features and amenities including climate control, ambient interior lighting, heated and ventilated seats and many more. When it comes to luxury, space, and comfort, nothing can beat our Lincoln Navigator, a perfect choice for both personal and business trips. 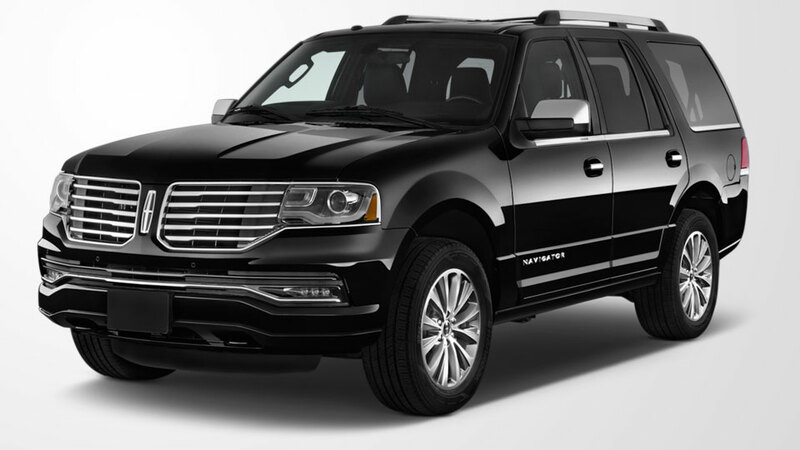 If what you want from a vehicle is comfort, luxury, and safety, then the Lincoln Navigator is the perfect option for you. It was designed and optimized to offer the highest level of satisfaction. It can accommodate up to 5 passengers. Our 2015 Cadillac Escalade can comfortably accommodate up to 6 passengers. 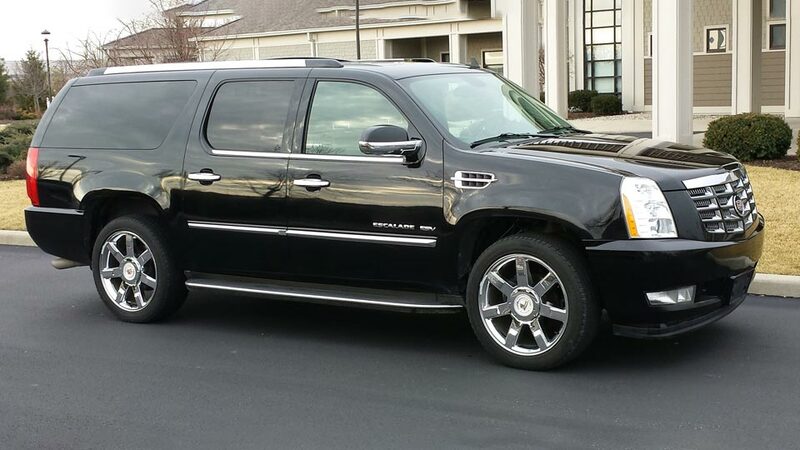 This vehicle can exceed the highest expectation and is perfect for arrivals and departures to the Greater Cincinnati airport, concert transportation, and as directed car service throughout Cincinnati, Dayton and Northern Kentucky. 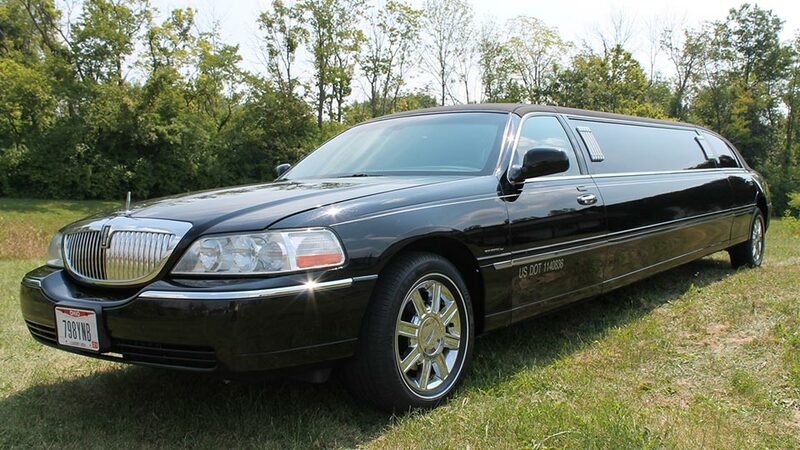 Our Black Lincoln Town Car Limousines are a classic! We currently have 4 to choose from. They all have neon lights, stargazing mirror and flat screen TVs. They all have J-style wraparound seating and can accommodate 8-9 passengers. Some have a 5th rear door which allows for an easier entrance. 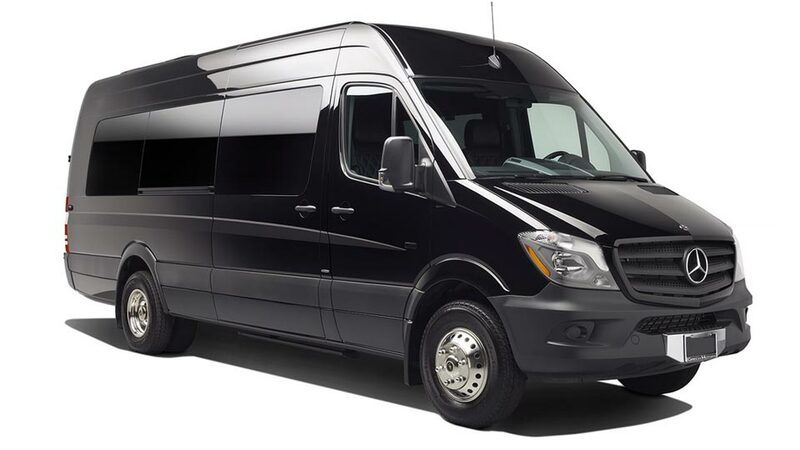 Our Mercedes Sprinter Shuttle can accommodate 11 passengers in forward facing seats. This shuttle van is also capable of holding 11 pieces of luggage and features a raised roof for ease of movement. 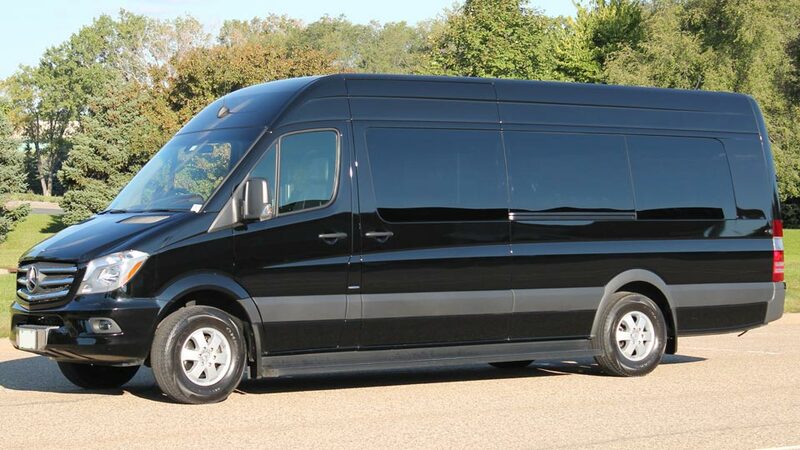 Our van is perfect for band transportation, airport transportation to The Greater Cincinnati Airport and for wedding guest shuttles. Click here to get a quote today! Our 2017 Ford Transit Van can accommodate 14 passengers in forward facing seats. Perfect for Cincinnati shuttle service, sports team transportation and The Kentucky Derby. 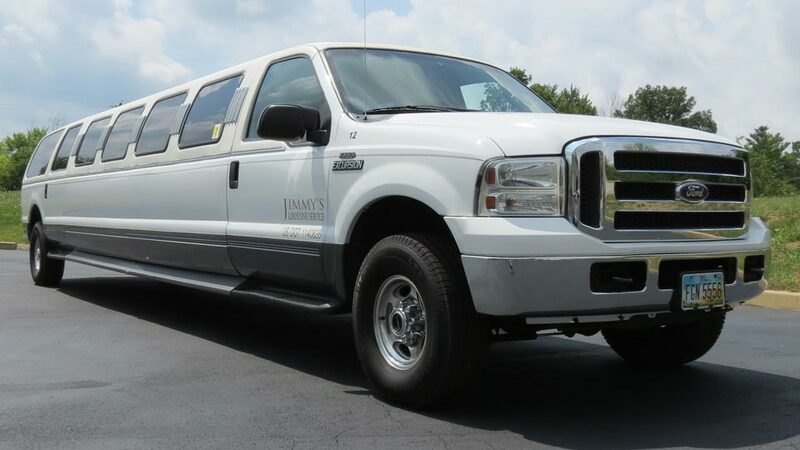 Our White Ford Excursion Limousine is a 14 passenger super stretch. It has fiber optics, color changing ceiling neons, and a media device compatible stereo system. If you’re looking for a classic style limousine that is an affordable option, this limousine is a great fit! 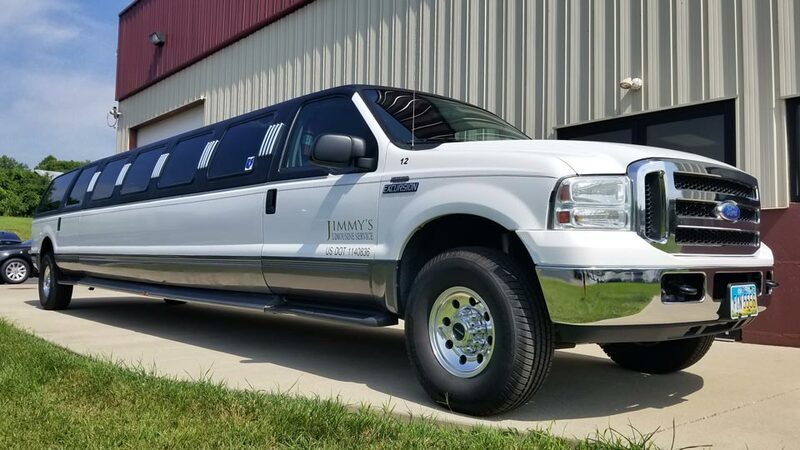 Our Black and White Ford Excursion stretch limo can comfortably seat up to 14 passengers. The Ford Excursion comes equipped with luxury amenities: fiber optics, color changing ceiling neons, media device compatible stereo system and climatic control. This limo is the perfect fit for that once in a lifetime events like weddings, the Kentucky Bourbon Trail or Keeneland. 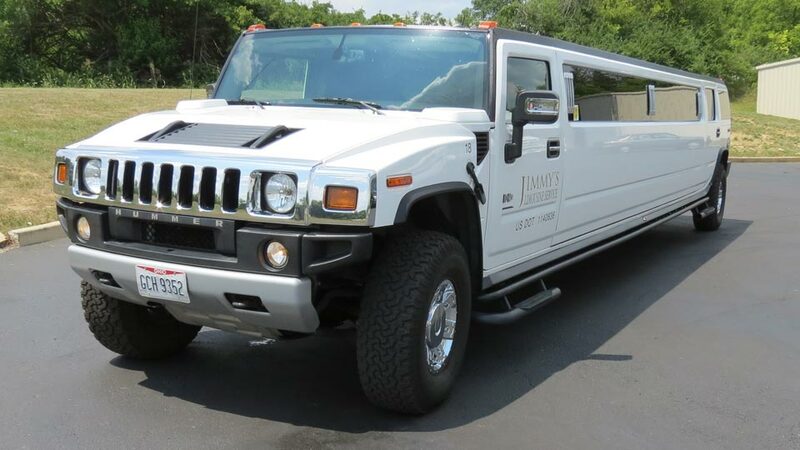 Our 16 passenger White Hummer limousine has J-style wraparound seating for up to 16 people. The iconic style of this super stretch will certainly make anyone feel like a rock star! This limousine is media device compatible, has fiber optics and 3 TV’s. Click here to get a quote today! Our White E450 Limo Bus can hold 20-22 passengers. This party bus has fiber optics, laser light shows, color changing walls and a wooden floor and blinds for added privacy. It is iPod capable and has several ice wells. If you’re looking to ride in style with the maximum amount of room, this is the best choice! 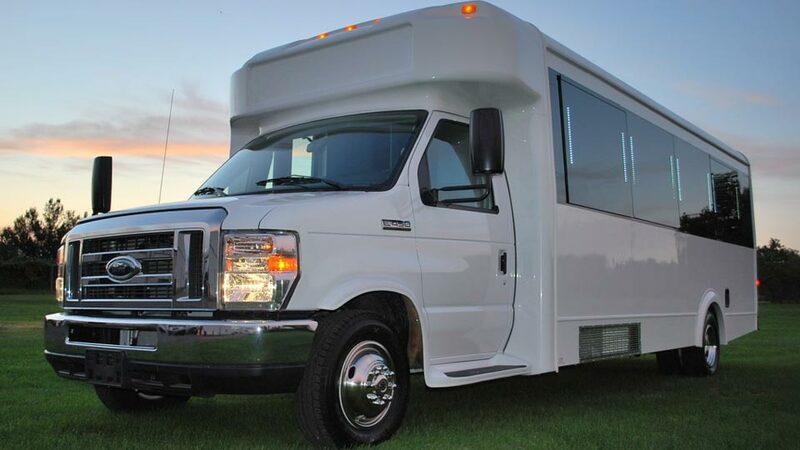 Our White Ford 550 Limousine Bus #14 can hold 22-24 passengers. It has fiber optics, laser light shows, a color changing ceiling, karaoke, a wooden floor and blinds for added privacy. It is iPod capable and has a large ice well. 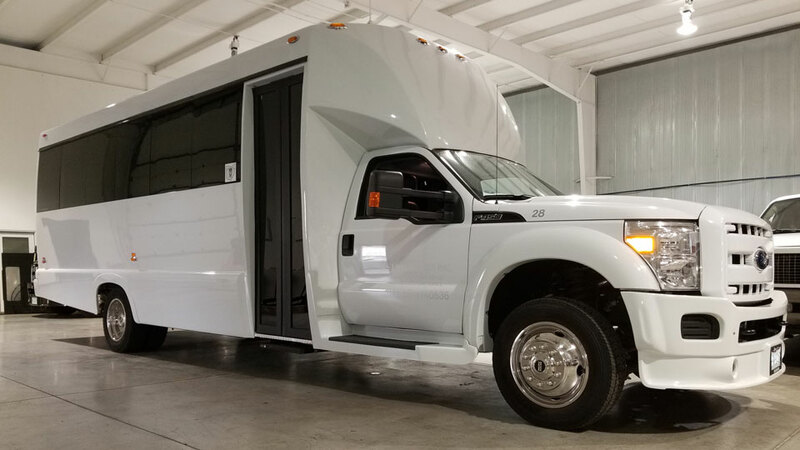 If you’re looking to ride in style, this party bus offers the maximum amount of room for any group size. Click here to get a quote today! 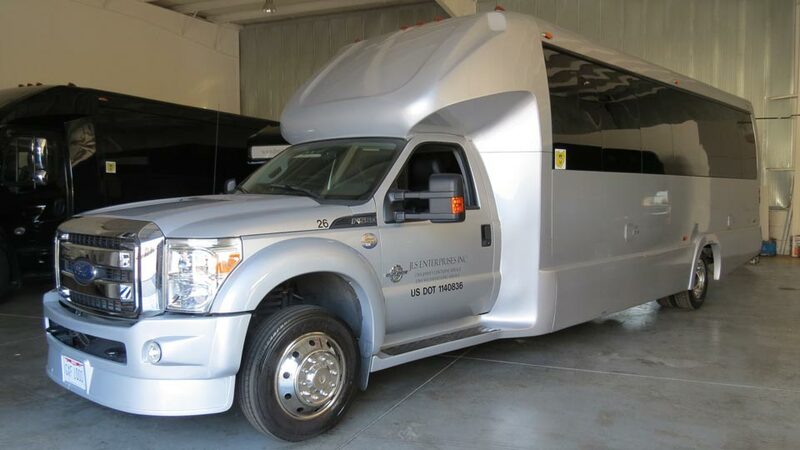 Our White F450 Limousine Bus #28 can accommodate up to 24 passengers in comfort and style. This party bus has fiber optics, laser light shows, color changing walls, a wooden floor and blinds for increased privacy. It is iPod capable and has several ice wells. If you want to ride in style with the maximum amount of room, this is a perfect choice! Click here to get a quote today. 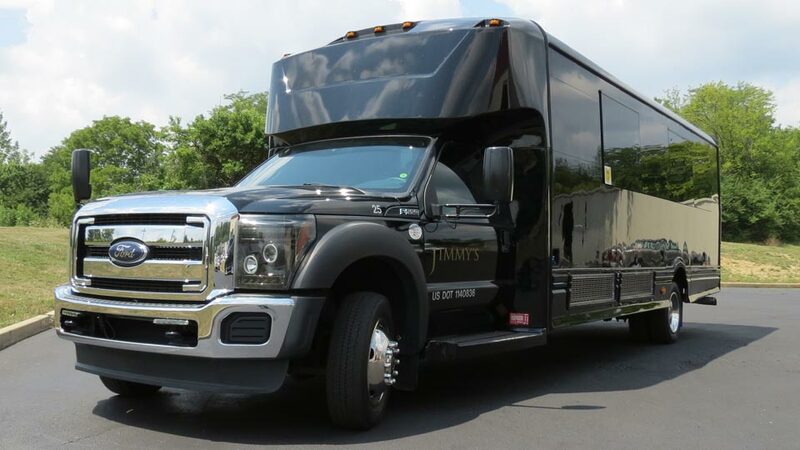 This is the perfect luxury bus to take on tours and The Kentucky Derby. 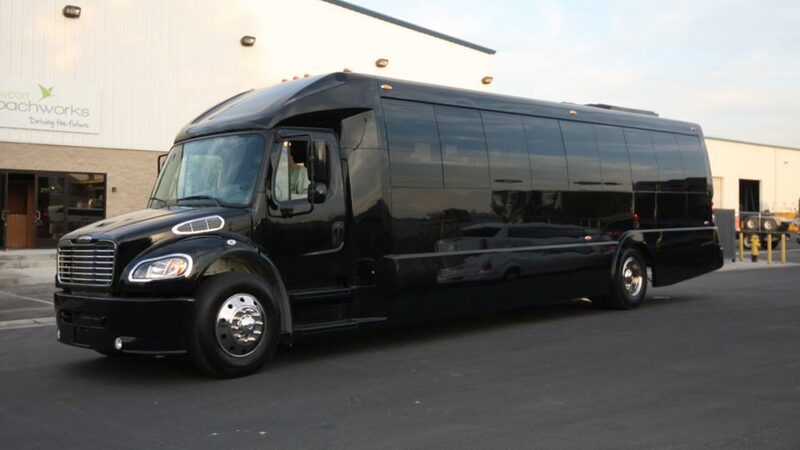 Our Black Ford 550 Limousine Bus #27 is a 28 passenger party bus. It has fiber optics, laser light shows, color changing ceiling and a wooden floor. If your looking to ride in style with the maximum amount of room this is the best choice! 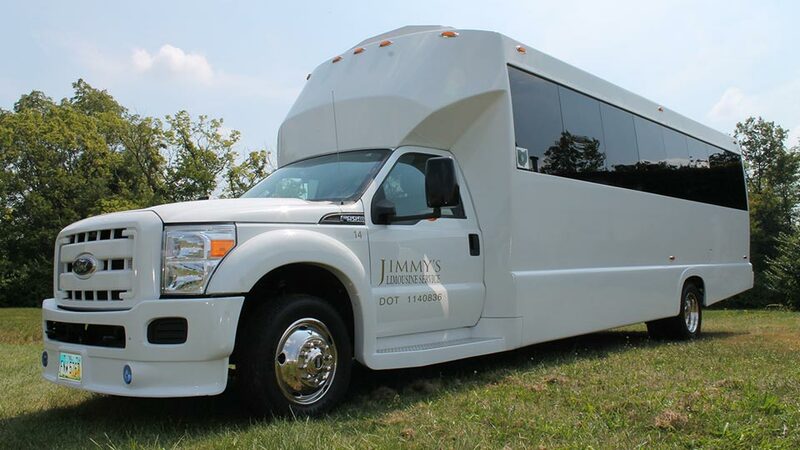 This limo bus has become a wedding favorite for Cincinnati brides. It is also a perfect option for Keeneland! Our 26 passenger limo bus is an elegant bus option. Our high end buses create an atmosphere appropriate for weddings, corporate events and special events in the greater Cincinnati area. The perimeter seating allows you to face your guest and engage in conversation. The passengers have full control over the lights and sound. You can turn on the neons and strobes for a fun night or wedding celebration! If you want to keep it professional, no problem. Just use the white lights. This is the perfect bus to attend The Kentucky Derby! Our 28 passenger limousine bus is an elegant bus option for almost all occasions. Our high end buses create a fabulous atmosphere for weddings, corporate events and other special events in the greater Cincinnati area. You have full control over the lights and sound. Add a little color to your party on wheels and turn on the neon’s and strobes! If you want to keep it professional, no problem. Just use the white lights. The best part about this bus is it has a bathroom! That’s right, no more stopping at rest stops or dirty gas stations while on your way to Keeneland! Click here for a quote today! 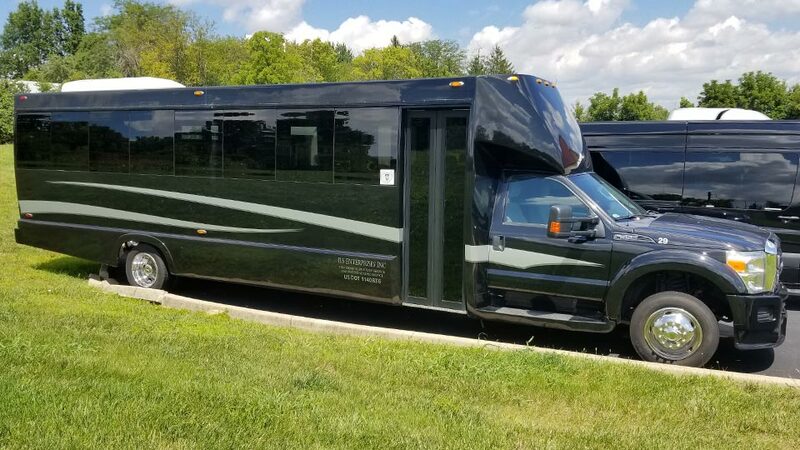 Our 27 passenger Minibus is perfect for corporate events, Keeneland, The Kentucky Derby and shuttling wedding guest in Cincinnati, Dayton and Northern Kentucky. Our Minibus features forward facing leather seats, 6 mini TV’s and 1 large TV in the front. This bus has over head compartments that will hold carry on sized luggage and rear storage for 27 additional bags. While traveling you can watch a DVD, show a Powerpoint presentation or sync you phone to enjoy your own music. Click here for a quote today! Our Business Class Charter Bus #20 can accommodate 43 passengers in forward-facing leather reclining seats. Our charter bus has an AM/FM & CD/DVD Stereo. With our WiFi, 41″ LCD TV and 4 11″ TVs you can enjoy a movie or play a Powerpoint presentation. Our charter bus is perfect for The Kentucky Derby, Senior Group Trips, Athletic Team transportation or The Bourbon Trail. The best part about this bus is there is an on-board lavatory! Click here to get a quote for your next trip. 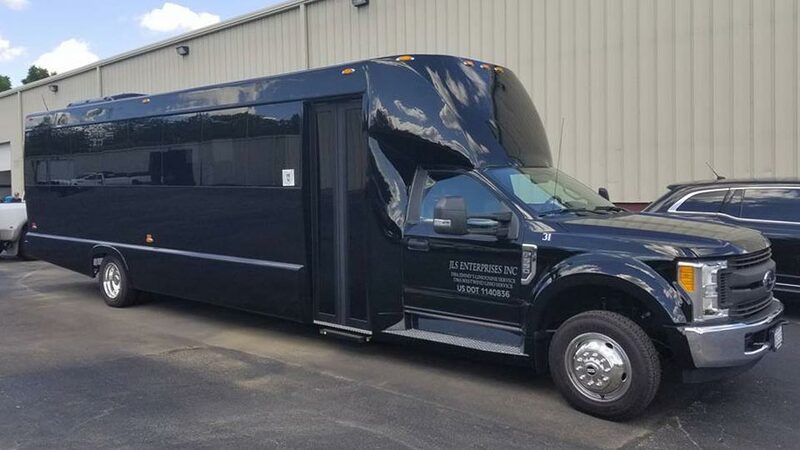 Our brand new 36 passenger limo bus/ party bus is an elegant bus option any Cincinnati or Northern Kentucky event. 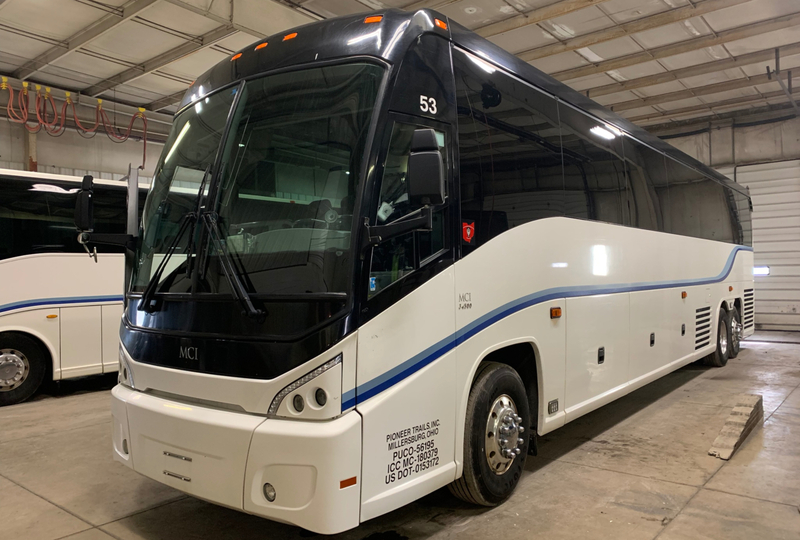 Our high end buses create a fabulous atmosphere for weddings, corporate events, Keeneland and other special events in the greater Cincinnati area. You have full control over the lights and sound. Add a little color to your party on wheels and turn on the neons and strobes! If you want to keep it professional, no problem. Just use the white lights. The best part about this bus is it has a bathroom! That’s right, no more stopping at rest stops or dirty gas stations while on the road. 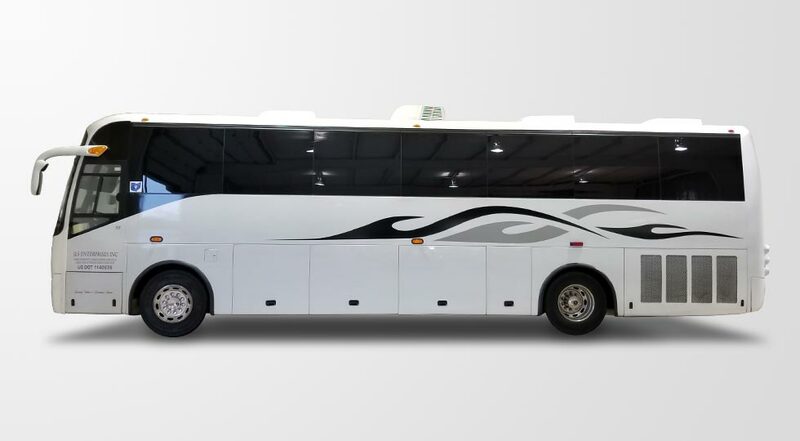 A top-of-the-line, fully equipped coach perfect for group travel. Ideal for school groups, university transportation, athletic teams, corporate events, conventions, social functions, and church outings. Our bus has 56 reclining seats, under body and overhead storage and a restroom. WiFi Available upon request for an additional fee. Perfect bus for The Kentucky Derby! We offer day rates and multi day discounts. Contact us today for rates and availability! Click here for a quote.